The Russian education system is one of the most developed and advanced in the world. In the context of a changing society, the educational system proved to be adaptable to rapid transformations and also serving as a tool for long term reformation and progress. Higher education is under the jurisdiction of the Ministry for Education and Science of the Russian Federation, which is responsible for the accreditation and licensing of higher education establishments, and for developing and maintaining State Educational Standards. Only accredited higher education establishments have the right to issue state diplomas and degrees ensuring full vocational and academic rights, have the right to use the seal with the national emblem of the Russian Federation, and are covered by the international agreements on mutual recognition and validation of education documents. All state degrees awarding specific qualifications to a graduate, irrespective of the type of educational institution (University, Academy, and Institute) and the ownership pattern (state, municipal, non-state), are equal in status. - Initial vocational schools, including PTU, offer one-and-a-half to two years of purely professional education and a vocational school which offer joint professional and secondary general education for three to four years and skilled workers' training at different levels. - Non-university level higher education institutions also offer three to four year professional and secondary general education and two-year vocational training for holders of the School Leaving Certificate. Secondary general education on the basis of basic general education continues for two years and ends when students are 17-18 years of age. Secondary education leads to the reception of the Certificate of Complete Secondary General Education. Graduates from a secondary general school may apply for enrollment to a higher education institution. 1. Basic higher education (4 years) leading to a Bachelor's degree, the first university level degree. This is equivalent to the B.Sc. degree in the US or Western Europe. 2. Postgraduate higher education (5-6 years or more). 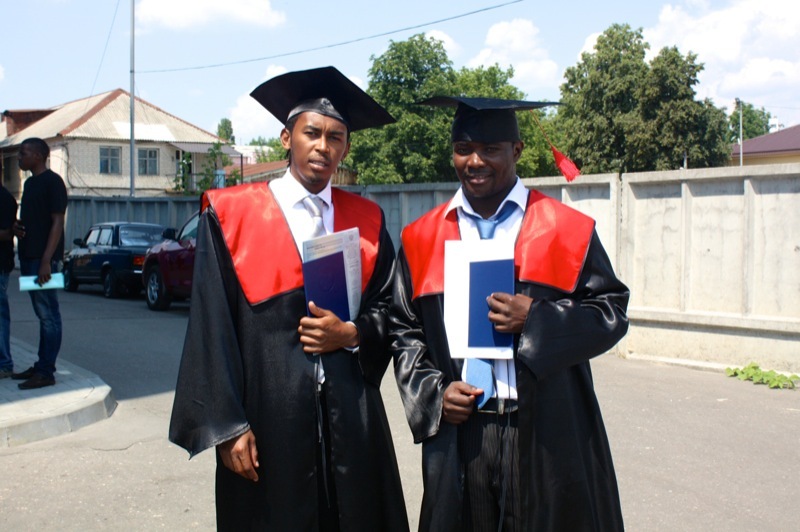 After two years, students are entitled to receive a Magistr's degree. This is equivalent to a Master's Degree (M.Sc, M.A.) in the US or Western Europe. After a Master's degree, students can continue to study towards a doctoral degree: the first level, equivalent to Ph.D. and the second, highest level, equivalent to Professor. - Diploma of Specialist (5-6 years of training) - final qualifying Specialist and Master of Science degrees give graduates the right to enter Postgraduate courses. 1. University is a higher education institution with activities aimed at developing education, science, and culture by performing fundamental scientific research and training at all the levels of higher education within a wide range of Natural Sciences, Humanities and other directions of science, technology, and culture. 2. Academy is a higher education institution aimed at developing education, science, and culture by performing fundamental scientific research and training at all the levels of higher education, mainly in one specific area of science, technology and culture. 3. Institute is an independent higher education institution or a part (structural unit) of the university, and academy that applies vocational educational curricula in specific areas of science, technology, culture and is involved in scientific research. Having obtained the Bachelor's degree, students may apply to enter the Master's Degree program or continue their studies in the framework of the Specialist's Diploma programs. The Bachelor's degree is awarded in all fields except Medicine after defending a Diploma project prepared under the guidance of a supervisor and passing the final exams. In Medicine, the first stage lasts for six years. The academic year starts on the first of September and ends at the end of June. It is divided into autumn and spring semesters. A study period of 16 weeks in the autumn term and a study period of 15-16 weeks in the spring term during which a course is taught. Each semester ends with one assessment week during which students take course tests and present assignment work and defend their course projects. Two or three week period is set aside each semester for examinations and the completion of final assessments.